India are playing Australia in the crucial deciding match of the ODI series at the iconic Melbourne Cricket Ground. The visitors made three changes to the team with Vijay Shankar (on debut), Yuzvendra Chahal and Kedhar Jadhav coming in for Mohammed Siraj, Kuldeep Yadav and Ambati Rayudu. Bhuvneshwar Kumar struck twice in the first 10 overs to leave Australia at 30/2. With Shaun Marsh and Usman Khawaja looking to rebuild the innings, Indian skipper Virat Kohli brought on all-rounder Vijay Shankar and part-time off-spinner Kedhar Jadhav from both ends. The duo quickly ran through the 10 overs and maintained pressure on the Australian batsmen. Both Shankar and Jadhav combined to complete the 5th bowler quota. Then, Yuzvendra Chahal and Ravindra Jadeja were brought into the attack and it turned out to be a masterstroke. Let us take a look at skipper Kohli's strategy behind delaying Chahal’s introduction into the attack and why it helped India restrict the Australian batsmen. There are two teams that have defined how modern ODI cricket is played. And their approaches are separated by a spectrum as broad as any. One one end of it is England for their unabashed and aggressive approach from the word go. They have racked up totals in excess of 300-350 regularly and put pressure on the opposition with runs onboard or with their potential to chase down any target there is. The England team is packed with hitters from the top through their tail. At the other end of the spectrum is India. A team that prevents the best batting line-ups from racking up huge totals and at the same time also boasting of a powerful top order that can make light work of any given total. If India bat first, you would expect them to rack up humongous totals on a regular basis. But if they bowl first, you would expect them to invariably restrict the opposition to a below-par total courtesy of their bowling attack and then chase down whatever remains as a total. But of late, India’s ODI matches haven’t exactly gone as per script. The reason? A missing piece of the jigsaw, namely, Hardik Pandya. In recent times, India have been exposed quite a few times as they were made to abandon their set script. And never has this been as evident as during the ODI series against the Aussies. Twice in the first two matches, the Aussies found a way around Kuldeep Yadav. Yes, the absence of their ace in Jasprit Bumrah was bound to create some problems. But Bhuvneshwar Kumar was doing all right and so was Mohammed Shami. So what went wrong? Yes, the spin twins were separated and that was one of the major issues. Kuldeep and Chahal love hunting in partnerships and they have reaped great success in each other’s company. The most prominent display of their potency came in India's 5-1 victory in South Africa. Ever since the injury to Hardik Pandya during the Asia cup and the subsequent happenings that have kept him out of the game, India have opted to play Ravindra Jadeja over one of the two wrist-spinners owing to his all-round abilities. But what this has also meant is that Kuldeep Yadav, who has been preferred over Chahal on most occasions, has had to bowl early in the innings. At times, as early as in the powerplay overs. What needs to be noted here are the conditions under which the duo have managed to get their wickets. The spin twins are at their best when they are attacked. That is when they gain the upper hand over the batsman with the peculiarly low pace on the ball and their ability to turn the ball both ways. But here in the absence of Hardik Pandya, who used to be India’s first change bowler, India have been forced to bring in their leg-spinner at an early stage. With Bhuvneshwar managing to strike early in both matches, this meant that the batsmen were trying to rebuild. And hence they were not attacking Kuldeep Yadav and India were deprived of wickets. By the time they settled in, Kuldeep's quota was more or less done and India were not able to restrict them as easily. This brought back memories of the 2017 season leading up to the Champions Trophy when the spin pairing of Ashwin and Jadeja were not able to pick wickets and were hence milked for runs. Fast forward to the third ODI and the first 10 overs became all too familiar. Bhuvneshwar continued to be excellent by picking up two early wickets. Australia were at 30/2 after the first two overs. And here was where Kohli's captaincy became impressive. 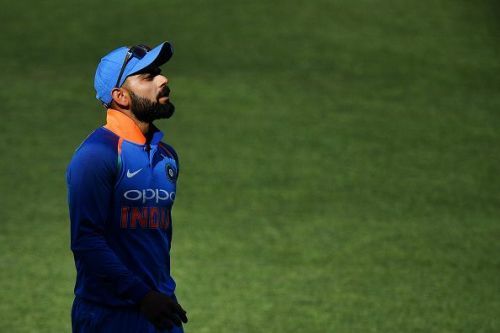 Shaun Marsh and Usman Khwaja were trying to rebuild again, and skipper Kohli decided to bring on the duo of Vijay Shankar and Kedar Jadhav. They ran through the ten overs quickly and kept a lid on the scoring rate as well. After the debutant all-rounder and the part-time off-spinner, Kohli brought in Chahal. At his best when the batsmen attack him, the leg-spinner registered remarkable figures of 6/42. What the Indian captain did by bringing on Jadhav and Vijay Shankar between overs 10-20 was not just about getting done with the risky overs in India’s bowling innings. It was also about understanding in what scenario the bowlers were most effective and giving them the chance to be at their best. Kohli is learning the art of captaincy pretty quickly and he might just have pulled off a major masterstroke at Melbourne.